“Come out, come out, wherever you are”, she called in a singsong whisper. I turned around to see Eilir hunched over a fallen, rotting log, knocking on its undergrowth of mushrooms with a birch stick. “Tinkerbell? Rosetta? Anybody home? You’re safe to come out: it’s only me, Eilir.” In the land of hobbits, elves, and orcs, there’s no better place for a fairy to call home. 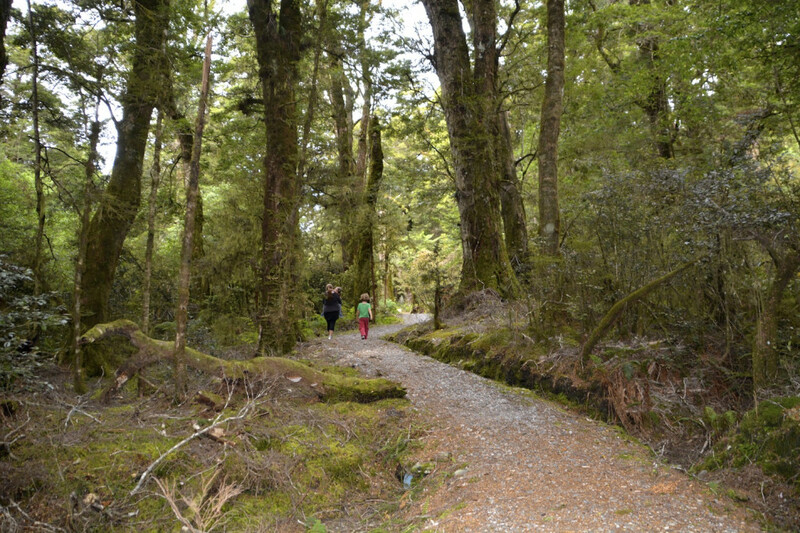 Unspoken, this was immediately obvious to Eilir as she tiptoed along the mossy forest floor, kauri trees towering above her. She hung back from the family, bidding us silently to continue without her, as she sought to commune with the forest fairies. The strength, purity and innocence of her simple wish, to actually become a fairy, transports me back in time to the magic of childhood, and makes me cherish this fleeting time with her even more. My sister, Monica, and I grew up in the woods. We shared a bedroom in a tiny, landlocked house in Connecticut on a parcel of land with no neighbors other than the semi-rural Chevrolet dealership in front from whom my parents rented the house. We had a small, muddy pond in our front yard that was fed by a bubbling brook that defined the property line from backyard to front. In the summer, bullfrogs would come out in full force, a snapping turtle taunted us from the water’s edge, and orange spotted salamanders would become our treasured pets. I have vivid memories of a special spot by the stream where we would sit, watching waterbugs waltz across the water’s surface. In the winter, on the frozen pond, my father would shovel mazes through the snow and we would ice skate for hours, playing fox and hound. Our back yard was flat and grassy, with mature maple and oak trees, but the true adventure started at the yard’s edge, past our aluminum swingset, where the woods began. The summer of 1979 stands frozen in time in my memory and is the essence of my childhood. I was 5 years old, about to turn 6 in the fall. My father was always off at work. My mother was a high school English teacher and a full time law student, pregnant with my brother Max. Monica and I were sent outside each morning and told not to come back until summoned. “Ee-Ah-Kee” was my mother’s call out into the woods. “Ee-Ah-Koh” was our required reply. With that we would come running home, to find a tunafish sandwich for Monica and a butter and sugar sandwich for me left out on our wooden deck for lunch. After eating, we would return to the forest, exploring far and wide, committing each tree and rock to memory, or building forts in the shapes of teepees or gigantic bird’s nests. Close by to us were the mysterious, tree-less depressions where the dinosaurs had laid their eggs. Further afield was the Emerald Forest, a grove of fur trees that surrounded a small lake, where the light cast a greenish glow through the pines. This was an enchanting place, where fairies most likely dwelled. If one walked for hours in large multi-acre circles, sometimes one would happen upon an eerie, bewitched farm, landlocked in the forest, where goats, pigs and chickens were held in hand-crafted wire cages. Only once did we meet the old man who lived there, who offered for us to come in and pet his animals. Most of the time, the farm was invisible, ne’er to be seen. Although I currently feel most engaged and alive in the middle of a city, all that is most tender or gentle in me can be traced back to these woods. Taking this trip with the kids at ages 4 and 5 has opened up a door to this world for Staffan and me. The banter from the back of the campervan often stops our conversations in their tracks, as we pause to listen to the world as perceived by children. Over the course of the trip, they have progressed from total fear of falling off the earth at the southernmost tip of Africa to reminding each other at the southern tip of New Zealand that they are actually upside down, but gravity keeps their feet on the ground and the enormous size of the earth makes it all seem level. They are bright philosophers, holding many discussions about death and reincarnation, fancying which type of animal they might be in their next coming. There’s certainly a lot of laughter as they conjecture what the other probably was in their last life. 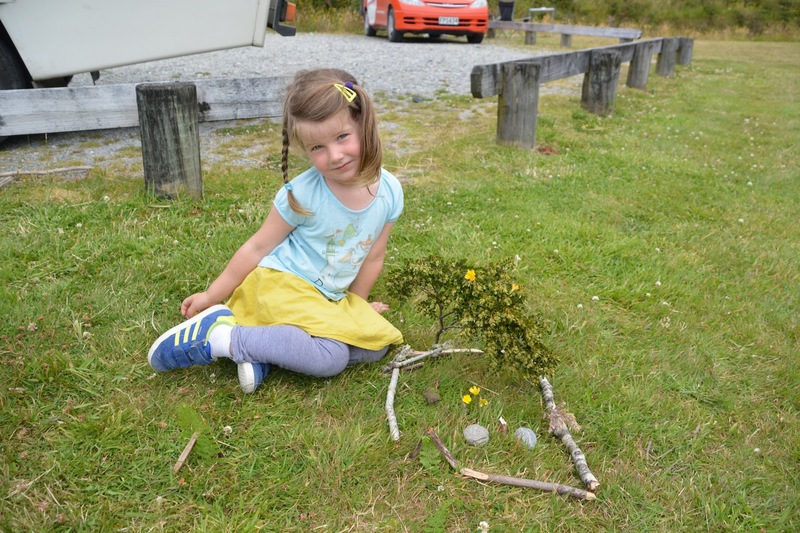 From a beautiful campsite on the Haast Pass I observed Eilir making a wish while blowing the white tips off a dandelion. She blew and blew, but the seeds were not ready for flight. So she murmured her wish once again, and ate the flower. 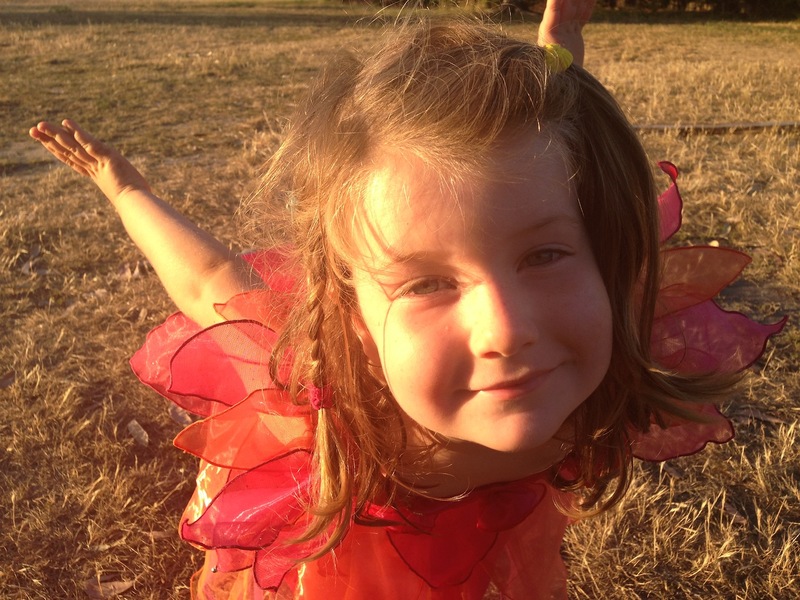 I later found her in tears, sad that she would have to choose between becoming an astronaut and a fairy. Her wish was to be able to be both, but she feared it may not come true because she could not blow the seeds, and was doubly doomed now she had revealed her wish. In the end, she was consoled by building a fairy house from materials found on the wood’s floor. It had a bedroom, a table with chairs, and an outhouse. In the morning we were surprised that fairies had indeed come, leaving a trail of sparkling fairy dust, a miniature bouquet of wildflowers, and a teeny tiny note for Eilir, crafted in cursive 1 point font. The foundation for our fairy house, Eilir dreamy at the thought of fairies visiting in the night outside our campervan. 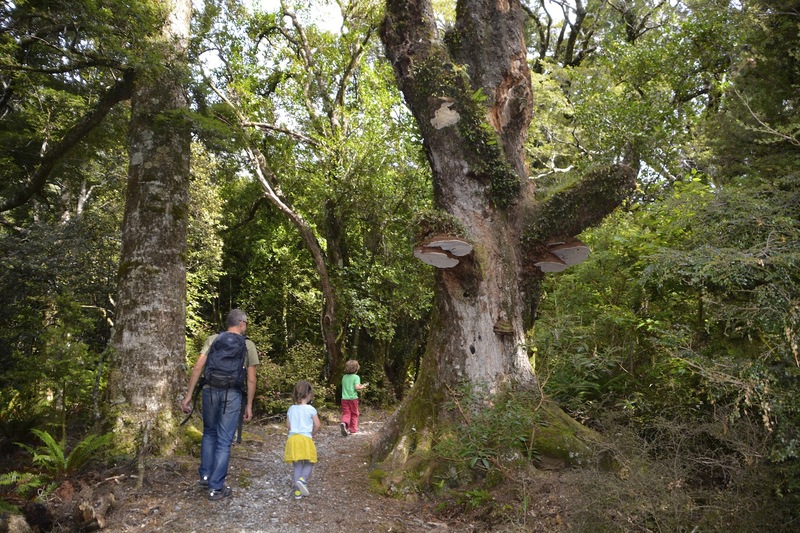 Not only is New Zealand the perfect environment to explore the enchanted realm, it also brings you right to the heart of Middle Earth. Both the The Hobbit and the Lord of the Rings trilogy were filmed on locations throughout the North and South Islands. Of all the familiar landscapes, two places really stood out for me, suspending my disbelief and transporting me back into the movies: Milford Sound and Hobbiton. Milford Sound is the site after which the gates of Argonath in The Lord of the Rings was modeled, and the rolling green hills of the North Island were carved out to become Hobbit’s Shire. We did not dork out and follow the month-long LOTR tours of New Zealand, but we were always on the lookout. 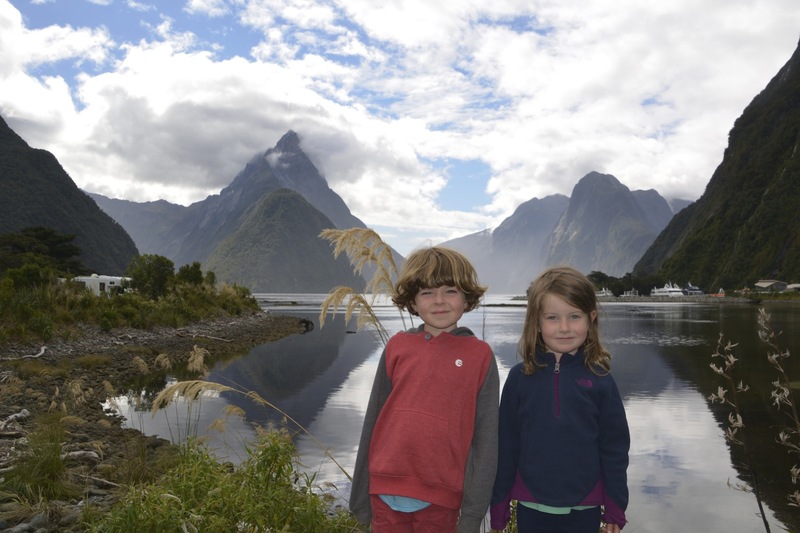 Whereas Milford sound (actually a fjord) is largely inaccessible unless tramping the Milford trek, we took a small boat cruise down the channels that had lured in the explorer John Grono in 1812. The more famous explorer James Cook who discovered so many areas in New Zealand actually sailed by and missed the narrow entry. I can only imagine what a delightful surprise it was for the seafarers to discover this fjord. Majestic, sheer cliffs drop 1500 meters into to the dark and calm waters, completely protected from the rough seas. There is a rawness to the Fjordland area, uninhabitable not only because of the steep rocky passages, but also due to the swarms of native sandflies. Striking a titanic like pose at the stern of our ship, I found myself wondering how many additional takes needed to be shot on the Lord of the Rings, as frantic swatting for the bloodsucking flies is not easily digitally remastered. 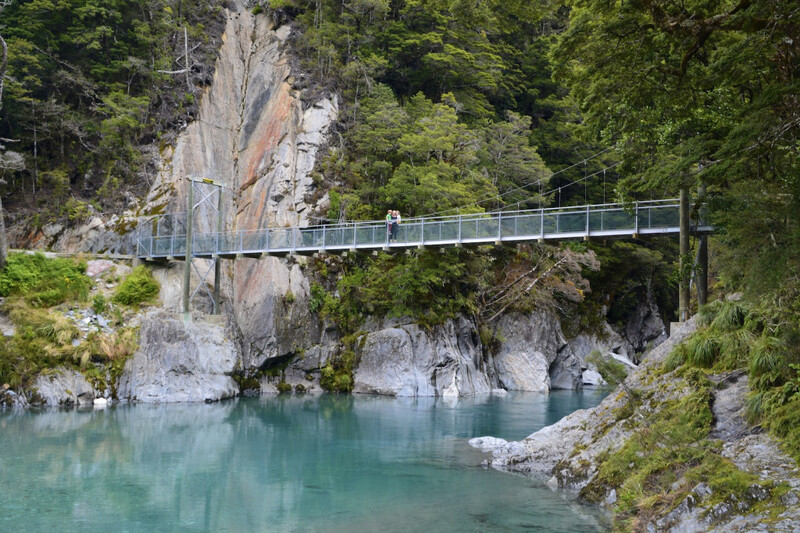 Milford Sound itself, and the drive in from Te Anau, is home to thousands of thundering waterfalls, all crashing down rocky faces that had been patiently cut by glaciers. 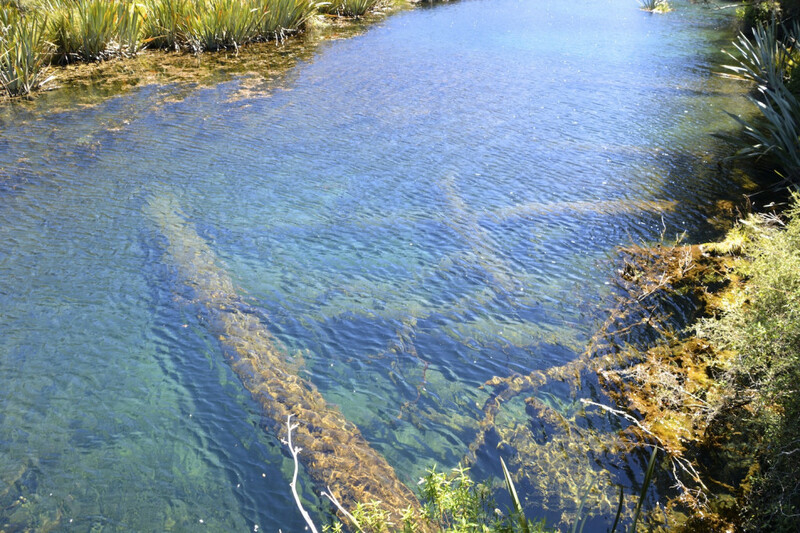 We found many places to pull over and take in the views, throw rocks into wide but shallow rivers, and take small walks into the woods, usually leading to suspension bridges and mirrored lakes, or swamps with crystal clear visibility that allowed one to watch all the activity below the surface. 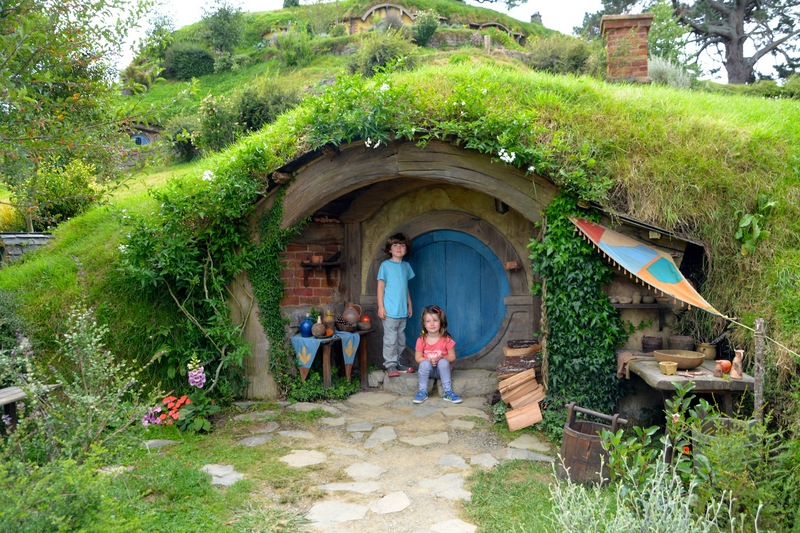 Hobbiton is found on the North Island, and is the actual set of the Hobbit and Lord of the Rings. Although this is clearly a tourist attraction rather than natural beauty, it was fascinating nonetheless, as the attention to detail was fantastic. 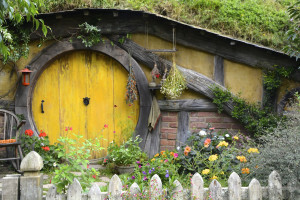 There are 44 hobbit dwellings, all cut into the hills and decorated with beautiful flowers, gardens, and fruit trees. There is a working vegetable farm that was producing giant squash and the hills were dotted with real apple and pear trees. Some hobbit holes had fires on, a welcoming smoke rising their chimneys. It was so realistic that Phineas and Eilir were convinced the hobbits were hiding around every corner. Unfortunately, given their shy nature, no hobbits were spotted. After a 2 hour walking tour, we ended at the Green Dragon Pub, where we happily drank stout and amber ales that are brewed specifically for Hobbiton. The kids were allowed to have a hobbit soda (ginger ale) from a beer mug, and were supremely excited to be included at the bar with the adults, drinking a bubbly beverage. A perfectly-sized home for us! The first time I visited the Sequoias of Northern California and the Redwoods of truly Northern California, I remember wishing my parents had taken me there as a young child, to amplify their effective size and deepen my sense of enchantment. Little did I know at the time that it would be possible to revisit this realm when I had my own children. Our wanderlust has taken Staffan and me to some of the farthest reaches of the earth; extended travel has allowed us to dwell on its wonders. Yet after all our travels and experiences, the landscape of childhood remains the most diverse and magical, and the one to which we delightfully return, hand in hand with Phineas and Eilir.